Okay, this soup is really called Peanut soup with chicken and banana... but it’s garnished with Seroendeng which is a spice-blend made from coconut, peanuts and spices - and when you swirl it through the soup - it tastes just like a Chick-O-Stick. Some of you may not know what that is, so I’ll tell you. A Chick-O-Stick is one of my most favorite “old fashioned” candies from America. Recently one of my awesome family members sent me a care package full of all kinds of American candies. I specifically requested a Chick-O-Stick. She had to look pretty hard but she found me one. It was one of the first things I ate. Loved it. A Chick-O-Stick is kind of like a Butterfinger without the chocolate. It’s peanutty, crispy, sweet and it’s got coconut. In one word it’s yummy. 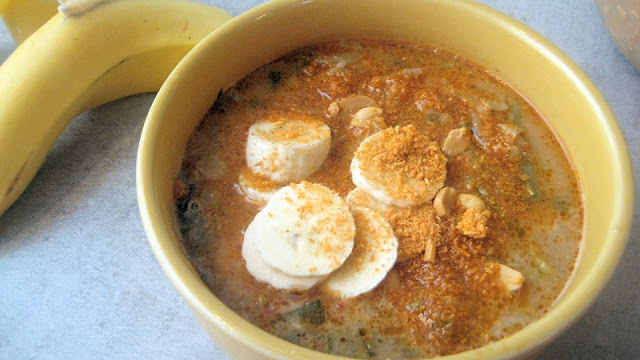 So, I found this recipe for peanut soup and it contains bananas! Of course, I recently wrote another blogpost with recipes containing bananas... and in that post I said that a friend of mine who grew up in Colombia said that they ate bananas with their soup - as opposed to us Dutch and Americans who eat soup with bread. So, I just had to try this recipe to see if it was any good. It’s not that the bananas don’t taste good in it - they were okay. I just prefer it with bread. I ate mine with pita bread actually. The bananas gave it a little something sweet but it doesn’t really need them - unless you are from Colombia and you like bananas with your soup - then - go for it. So, cut the leek, celery and carrots up finely - or use a precut bag of vegetables for soup, which is what I do - much easier and faster. Bring a soup pan with the peanut butter and bouillon to boil. Add the Sambal. Add the soup vegetables and green beans. Cook 10 minutes. In the last 2 minutes, add the bean sprouts and vegetarian chicken. Season to taste with salt and pepper, if desired. Peel banana and slices into 12 pieces. Ladle the soup into deep bowls and garnish with banana slices and sprinkle with Seroendeng and fresh herbs if desired. Also delicious with pita or roti. What creative to way to make soup! I love the idea of tropical flavors! Going Bananas - Healthy and Delicious!